The orders made on RFID trade can be paid in complete security, via PayPal or Bankwire. All trasnsactions and sensible data are sent through encryption granted by SSL certificate. Secure Payment is granted by PayPal, the most used and one of the safest online payment methods. 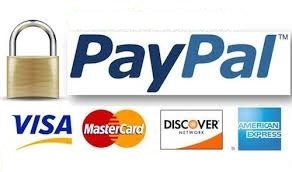 You can pay with your PayPal account, If you don't have a PayPal account, you can use your credit or debit card. We accept payments via bankwire, too. In case you choose this option, we will send you via email our bank data. Your bank may apply a fee on payments via bankwire.